I’ve been using Secunia for quite awhile now. I was surprised to find as many vulnerabilities as I did.I hope your readers heed your warnings.Right now I have a perfect score ,I’ll see how long that lasts. . Keep up the good work. You’re a pretty smart fellow, so I’m not at all surprised to hear you’ve found success with this app. This is one app that I can say that I’ve been using right from the very beginning, as you say it is one of the best free apps out there. That’s good news John. This is definitely one app that’s worth downloading. I couldn’t believe the number of vulnerable applications this found when I installed it. I think many people are taken aback when they see the results of the first scan. I’m glad to hear you decided to install this app. Agree with everything said above. 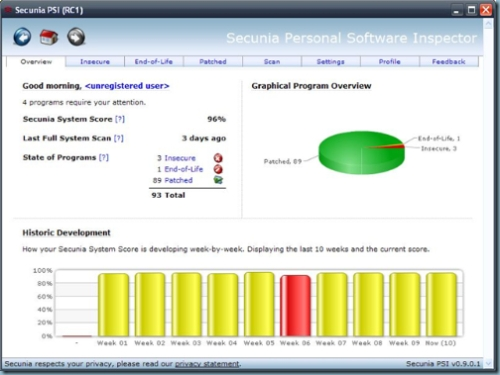 Been using Secunia for ages now. Quick and easy to use, informative, and they also have a great online forum with great moderators who respond quickly to questions too. I wouldn’t be without it. No surprise there Mal – you’re another smart fellow! I found the forum pretty interesting as well. Good to know the moderators are quick with a response – shows real professionalism. Glad you brought that up. I agree totally Bill. Staying on top of third party apps is just as important as updating Windows. Thanks for the support on this – much appreciated. 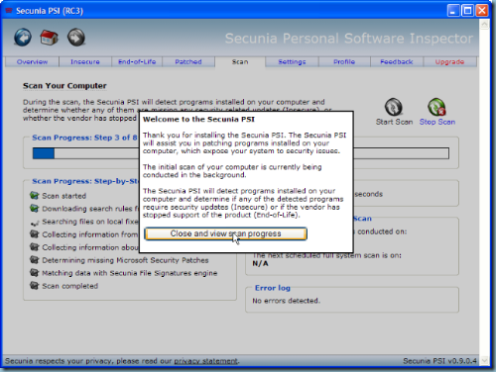 I think I’ve mentioned previously that I rely on Secunia PSI and FileHippo to keep applications up to date on my own PCs as well as those I support remotely. I can also attest to the high quality of the Secunia forums. Good to hear your experience in the forums has been positive. Have been using it since i switched to 7. And the fact that it has got a quality support– their forum and i must say, it’s one of those rare forums where your issue is dealt so nicely and with a rockinkg speed by ‘professional’ moderators..
As much as I hate to say this, it is Microsoft’s fault. The operating system was never meant to be secure against hackers. It was only meant to keep honest people honest. There are a lot of design flaws that make Windows insecure and until Microsoft works with the hardware manufactures to make the underlying technology more secure, it will never be secure. The best we can do for now, is to rely on good folks like Bill to keep us informed on what we can do to protect ourselves. Thanks for all your efforts Bill. You are doing the computing community a great service. Note to readers: Mr. Reiner’s site is one of my daily reads, and I highly recommend that you drop by. As well, checkout Mr. Reiner’s book – OWNED: Why hacking continues to be a problem. Which provides readers with a different perspective on computer security and hacking, by intermixing both subjects and explaining how and why hackers are able break into secured networks and computers. This book is for anyone using a computer; not just computer security professionals. Bill, I think what you say regarding malware infection is often correct. I have spoken with many friends who do not realize the benefits of scanning their computer regularly and using software to increase their computer’s productivity. Some admit to continuously postponing the Windows update. I have not used the PSI before, but will downloading it affect the speed of my computer? I don’t think you’ll notice any system slowdown – I certainly haven’t seen it. Nor, have i heard any reports that would indicate that this is a problem.